When the word “design” is used, images of Alessi’s citrus squeezer, the lamp of Castiglioni and the chaise Longue of Le Corbusier flash in high speed through my mind. I think of those objects and about what they inevitably become in most households; objects of admiration that must certainly not be used too much to avoid them wearing out. The true meaning of design, however, is combining aesthetics and functionality. So if I were naughty, I would claim that depriving these objects of their functionality degrades them to mere decorations. 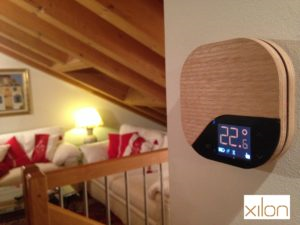 Therefore, we at Germani felt like a kid in a candy store when we bumped into a product that can be classified as a piece of true design in all of its’ senses; chrono thermostat Xilon. Apart from the fact that the aesthetical aspect is certainly there – and o yes, it’s customizable (woohoow) -, it would be quite difficult not to actually use your thermostat. So, in theory this product checks all the “design” boxes. That’s great, but which characteristics does it display in practice? 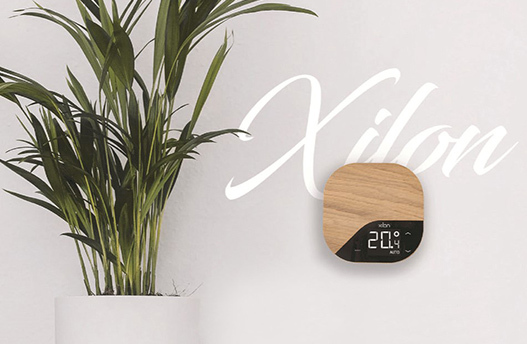 Uniqueness – not only in comparison to other brands because of its’ ability to be integrated in your furniture, but also in comparison to other Xilon thermostats, as every single piece is handcrafted in the wood and colour of your liking, rendering it exclusive. Sustainability – the raw materials used for crafting this thermostat are natural and therefore low-impact. Additionally, once installed, the thermostat suggests some energy saving settings automatically. Personalised comfort – every place is different, and as a consequence our needs differ according to the where we are. Nethix offers diversified versions of their thermostat to ensure the highest level of comfort that meets everyone’s possible desires: there are versions that can be operated manually, via Wi-Fi, via Bluetooth or via the SMS network for – amongst others – mountain houses where no Wi-Fi network is available. Xilon is a beautiful product; an example of true design. Bravo!